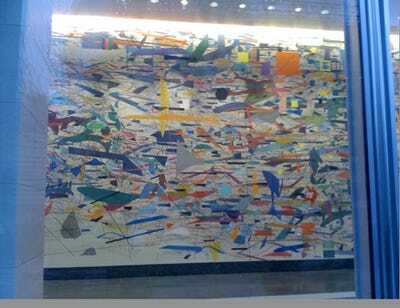 There’s a security guard sitting in the front of the new Goldman Sachs building that is constantly telling people not to touch the painting. He’ll only let one person, the artist, Julie Mehretu, get close enough to touch it. The artist visited the GS office with the author of her profile in the latest issue of The New Yorker. The painting is a huge mural (right) that Goldman paid $5 million for. They paid $10 million for the even larger Franz Ackermann mural in another entrance of the building. The employees apparently don’t like either one of them. The layers do sound like they look tempting, and Goldman’s security guard confirms it. He says people try to touch them once or twice per day.